What Do We Mean by Realignment or Death Spiral? The nation's energy system and its regulatory framework are in the midst of rapid realignment as a result of the current realities of a carbon constrained world, disruptive clean technologies, new financing models and novel user demands. In New York, these realities have the potential to profoundly affect the landscape in terms of how power will be generated, delivered, and ultimately used by customers. In short, a business-as-usual model is no longer a viable option for the utility industry. As part of Climate Week NYC 2014, the Sallan Foundation partnered with the NYC Accelerator for a Clean and Resilient Economy, Urban Future Lab, the Sabin Center for Climate Change Law/Columbia University Law School, NYU Wagner, the Environmental Defense Fund, and the New York League of Conservation Voters to put on an event entitled There'll Be Some Changes Made: Power System Realignment or Death Spiral? The conference brought together top experts and thought leaders in this rapidly evolving field to discuss the dynamics that are changing the electrical grid, as well as disruptive technologies that have the potential to make energy production cleaner and energy consumption more efficient. Nancy Anderson, Sallan's Executive Director, welcomed the speakers by quoting E.B. White, who famously said "It's a miracle that New York works at all." In 2012, Superstorm Sandy demonstrated that New York City sometimes does not work and is increasingly vulnerable to the effects of climate change. Anderson noted that this vulnerability is driving change in New York's energy sector as exemplified by Con Edison's 2013 rate case settlement, which requires the company to implement state-of-the-art measures to plan for and protect its infrastructure from the effects of climate change, and New York State's 2014 Reforming the Energy Vision (REV), which seeks to transform the state's energy sector to become more efficient, resilient, and accessible to clean forms of energy and new technologies. The Keynote presentations were delivered by Michael Gergen and Janet Joseph. Gergen, a partner at Latham & Watkins and an expert in energy regulatory markets, began his presentation by giving a brief overview of utility regulation, which has historically allowed power companies a stable return on investment and provided consumers with safe, reliable and relatively inexpensive electricity. However, Gergen noted that the rate of growth in the industry has slowed dramatically in recent years and currently stands at less than one percent annually. In addition, it is expected that $30 billion will be needed to upgrade the state's electrical grid over the next 10 years. In short, costs are outgrowing sales, and the industry is concerned about disruptions caused by new technologies that could pose additional threats to their business model. Gergen noted that the panels would discuss what this means for the industry, as well as the role that utilities should play in encouraging new technologies. "Joseph, Vice President for Technology and Strategic Planning at the New York State Energy Research and Development Authority (NYSERDA), focused much of her presentation on the new energy policy framework that is being developed in New York to make the energy system more resilient, efficient, affordable, and cleaner. This framework is called Reforming the Energy Vision (REV). Joseph explained that a reorientation of policy is necessary given that the challenges, such as greenhouse gas emissions and an aging infrastructure, require that the system become more resilient and less dependent on fossil fuels. In addition, costs for distributed energy resources and renewable resources are dropping and new digital energy solutions are emerging, which are presenting many opportunities to broaden customer choices. Joseph described the REV initiative, which will transform the way electricity is distributed and used by consumers in New York State. Joseph also explained that the newly created Clean Energy Fund, which will overcome clean energy market barriers and stimulate investment and innovation in clean energy, will work in combination with REV. In particular, the Fund, which will be administered by NYSERDA, will focus on four primary areas: market development, technology and business innovation, financing/NY Green Bank, and NY-Sun." The conference provides a thought-provoking and dynamic dialogue about what our energy future might look like. We know it won't look like today. It is already evident that the utility industry is facing climate, legal, technical and financial challenges and expects changes to our national and state energy policy; however, whether utilities will embrace these changes and how regulatory, technical, financial and consumer demand will align remains to be seen. The first panel was moderated by Elizabeth Stein, an energy attorney at the Environmental Defense Fund. Stuart Nachmias, Vice President for Policy and Regulatory Affairs, Con Edison. According to Delaney, a shift is beginning to occur in the power industry, where instead of viewing renewable energy as a threat to their business model, some utilities are starting to view renewable energy suppliers as potential partners as certain types of renewable energy, such as solar, begin to achieve scale and profitability. For Insogna, a primary goal of REV is to increase distributed energy resources throughout the state and build confidence in them. The Public Service Commission's REV proposal views distributed generation (such as solar, combined heat and power, and storage) as an important tool in making the system more efficient and flexible, and that REV recognizes the reality that there is no longer one way to achieve cost effective and reliable power. Nachmais spoke about the utility company's past and current efforts to conserve energy. He mentioned that Con Ed has been aggressive in its attempts to ramp up demand response programs, such as a pilot program in Queens to encourage customers to conserve energy, and that the company is actively pursuing these and other programs as a way to conserve electricity and defer capital investment. When asked what customers want, Nachmias said that Con Ed is looking for ways to make it easy for customers to engage, such as being able to control wall-mounted air conditioners remotely. Delaney echoed Nachmais' comments and pointed out that new technologies such as a combined heat and power (CHP) system at New York University continued to operate after Superstorm Sandy, thereby raising customer consciousness about the advantages of alternative energy. When asked what a low carbon grid would look like, Insogna stated that it would include a reduction in overall consumption as well as a reduced reliance on carbon intensive resources. From Delaney's New York City perspective, such a grid would include utility scale renewables such as offshore wind power, as well as imported hydropower. Nachmais said that such a system would have a much greater reliance on demand response and renewable energy, as well as continued investment in the production and transmission of clean energy. The second panel was moderated by David Biello, Energy and Environment Editor at Scientific American, and focused on companies and technologies that have the potential to make the traditional system of power generation and distribution obsolete. Jeremiah Miller, Analyst, Smarter Grid Solutions. Zalcman's company manages over 1,200 MW of power at over 700 customer sites, ranging from single family residential to large-scale commercial installations. Sun Edison was the first company to offer power purchase agreements (PPAs), which allow commercial and industrial customers to install renewable energy systems with no upfront cost and provides them with a stable, and in some cases lower, cost of electricity. Hellman's company, Eos Energy Storage, is currently working with eight global utilities to design and commercialize a low-cost, long-life, energy storage systems. One of the primary drawbacks of today's electricity grid is that it is designed for peak rather than average usage, thus requiring it to be overbuilt. As a result, it is both costly and inefficient. Widespread, commercially available storage capacity would allow power to be generated, stored, and converted back to electricity when and where needed, thus reducing reliance on more polluting and inefficient generation during periods of peak demand and down-sizing infrastructure investment required to deliver power during congested periods. Smarter Grid Solutions' Miller described how his company works with utilities in the United Kingdom to reduce the cost of interconnecting distributed energy resources to the grid. Biello asked the panelists whether utilities were at a "cell phone" (i.e. transformative) or "craft beer" (i.e. a niche for everyone) moment. Hellman stated that in his view the industry is in a transitional moment in terms of the way energy is produced and consumed. He mentioned that ratepayers are becoming empowered by new technologies and options, and that the REV proceeding offers a regulatory framework for achieving this. For Zalcman we are somewhere in the middle of this process (referring to Sam Adams, a popular craft beer), noting that the solar market is growing at an annual rate of 40% and can now compete with traditional forms of energy without subsidies. Miller noted that energy systems that have both solar and battery storage offers attributes that can be considered truly disruptive. 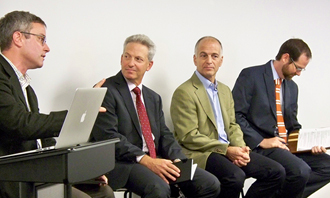 The panelists were also asked whether communities could be technology disrupters. 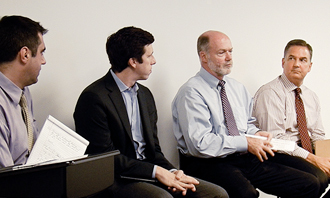 Miller responded that many barriers still exist, explaining that even communities with microgrids still must receive regulatory approval when their power lines cross public rights of way, and that getting a community to agree to implement these newer technologies can be very difficult to achieve. Hellman responded that urban planning has begun to incorporate some of these newer technologies at the design phase, making them easier and cheaper to implement. The panelists were also asked to discuss the soft costs and other remaining barriers to wider adoption of disruptive technologies. While Miller mentioned that the time period for getting permits for renewable energy systems has been reduced significantly, Zalcman observed that because each jurisdiction has its own regulatory requirements, it can be challenging for developers and that standardization, such as the adoption of model codes, would save both time and money. David Giambusso, Energy and Environment Reporter at Capital New York moderated the final panel. Sachse highlighted that his company spends a lot of time thinking about how to get customers actively engaged in their own energy consumption. In his experience, people want the lights to be on, power to be reliable, and for it to be easy for them to change their behavior. As well, while people care about saving money, this is not always the primary motivator, and that segmenting out customers in terms of those who like to be highly engaged and those who don't in terms of their energy usage can be useful in changing behavior. Gallagher, in contrast, believes that many people want to be more engaged in making decisions regarding their energy use. For Austen it was important to remember that while there were significant merits to a smart grid, we must remain focused on the costs that will be included in customers' total utility bills. He agreed with the other speakers that customer engagement is vital and that we must expand our efforts to conduct research to effectively determine customer wants and needs. 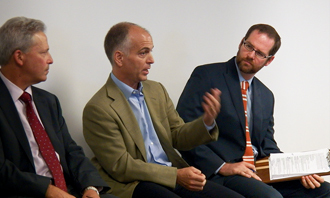 Panelists were also asked how a smart grid would be made secure and reliable. For Austen, data security of such a system is very important and he cited as an example some privacy concerns about the amount of customer data made available to third parties. 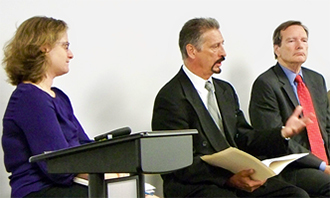 The panelists were also asked what data they would like to see that is not currently available. Sachse noted technology such as smart meters give utilities data can be very useful in measuring usage and demand and that, in general, more data is good, although the cost and best application of such technology is an ongoing issue. Gallagher would like to see better information on utility distribution systems at a local level, and that this could lead to older, more inefficient equipment being charged more, which would have the effect of encouraging newly and more efficient technologies. This innovation, in his view, could also be extended to customers who use energy inefficiently. According to Gallagher customers should be charged the true external cost of energy production. Keynoter Michael Gergen speaks to the decline in the rate of growth of retail sales for electricity. Keynoter Janet Joseph on REV as dramatic departure from how the State has approached electric utility policy in the past. Michael Delaney, Panel One panelist, POV over the last decade — at a minimum an evolution in the industry, maybe a revolution is coming. Steven Hellman, Technology Disruptors panelist, speaks to the portion of the world population that lives in energy poverty. James-Gallagher, Panel Three panelist looks towards a future that works from a cost standpoint. Cullen Howe is an environmental attorney with the New York City Council. He graduated from Vermont Law School with a degree in environmental law. He lives in New York City with his lovely wife Wanda and their three year old son Wiley.